built in the Roaring Twenties by a notorious rum runner. While the man is long gone, the mansion still stands, a reminder of a time when anyone with vision and guts could go from rags to riches, overnight. His name was Harry Low and this is his story. Of the hundreds of Windsor and area rumrunners, bootleggers, blind pig owners and whisky exporters, there were few giants. One was Harry Low. Harry Low was working as a machinist when he decided to open a pool hall on Sandwich Street. He didn’t realize it at the time, but the poolroom was the first step toward rum running and the fortunes he had always dreamed of. When prohibition came into full force in the United States and Ontario, Low saw a chance to make some easy money. He borrowed $300 from a friend and set up a bootlegging business selling liquor to poolroom enthusiasts. But the poolroom was quickly abandoned when profits from the $300 spurred him on to engage in the lucrative whisky export business. Low threw his energies into shipping liquor from a Windsor export dock on the Detroit River by speedboat, ostensibly headed for Cuba and West Indian ports – but, in fact, headed to Michigan destinations and Yankee blind pigs. Soon Low’s operation connected to a network from Windsor docks to Detroit, St. Louis, Chicago and points beyond. Low quickly outgrew the limited cargo holds of the speedboats. He invested his profits in two large cargo ships – the Geronimo and the Vedas. Aware of these activities, the United States border patrol agents seized the Geronimo. They moored it to a Michigan dock, but a storm set the vessel free and the Geronimo drifted back to the Canadian side where it soon resumed its rum running. Sometimes you also had to be lucky! 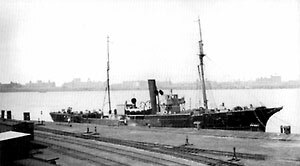 The World War I minesweeper, the Vedas, was refurbished and put into service hauling liquor from Montreal to Windsor, and also boldly crossing Lake Erie to the States for deliveries. But most often, the Vedas would transport its shipments from Quebec and rest offshore just outside the territorial limits of the United States. During the night, swift cruisers would steal out, load up the contraband and ferry it to shore. 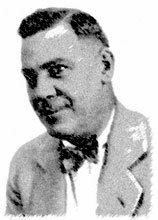 Harry Low had gone from bootlegger to businessman and was soon head of the largest export firm in the Border Cities – Low, Leon and Burns. This business virtually controlled the movement of liquor on the waterfront in Detroit and Windsor. It took over an entire railroad depot for its headquarters and fed shipments of booze to speakeasies and blind pigs in Detroit, Chicago, Cleveland and even to the infamous Rum Row on the Atlantic coast. But success didn’t come easy. Low went through the hectic, frenetic bootlegging apprenticeship like anyone else. He devised some bizarre ruses to get booze across the border. One time workers at a Ford plant were astonished to see a Model T hurtling off the end of a dock into the river. Low’s plan was to divert attention and send the police into action to drag for “bodies,” while Low and his racketeering rumrunners rushed three truckloads of liquor into boats and across the river. Low also invested in the multi-million dollar Dominion Square in Montreal, a towering office building that was the tallest in that city in its day. But his vision far exceeded his budget and cost-overruns finally led to losing ownership of the structure. Low and his associates were also linked to the gangland murder of one of their employees – John Allen Kennedy, discovered bludgeoned and shot through the skull in the woods near the Ohio-Michigan state line. Low was the vice-president of the Carling Brewery at the time, and Kennedy was a bookkeeper for the company. For weeks police attempted to link the Kennedy murder to Low, to no avail. Police never charged anyone, and the case remained unsolved. Low’s finances dwindled at the end of prohibition. He failed miserably as a promoter, invested unwisely and virtually crippled himself financially due to misdirected ventures. In addition to this he was continuously under investigation by the police. Following the 1928 hearings and the death of Kennedy, he was arrested in 1931 on a charge of trying to bribe an RCMP officer. Soon after, Low battled extradition to the United States to face a similar charge. He won the extradition fight but his troubles didn’t end there. By 1934 Low’s fortunes went the way of the stock market- this was the era of the Great Depression. His ingenious auto carburettor that was supposed to use so little gasoline – an idea automakers are still struggling with today. But in the thirties fuel efficiency wasn’t an issue, and his idea was scoffed at and rejected…and his financial resources dried up. An attempt to seize the contents of his plush Walkerville home to pay off his debts was blocked by Low when he proved $40,000 in antiques belonged not to him but his were owned by his wife. In 1934, Low and his associates launched Trenton Valley Promotions in Michigan. He resigned as its president in 1936. In 1939, faced with a United States indictment charging him and Walter H. Hardie, a vice-president of Trenton Valley, with stock swindling, Low moved to Sorel, Quebec, and returned to the shipyards, and was employed as a toolmaker, the profession he was working in before he started his career in rumrunning. He returned to Detroit in 1949, but when he attempted to set up his own machinist shop, his identity was revealed. He then returned to Windsor to quietly live out his days in a home on McKay Avenue. Harry Low died at Hotel Dieu Hospital in 1955.